A coughing cat could be allergic to several kinds of pollen. Yes, cat lover, your cat can develop a cough that's intermittent and painful. If this happens to your feline, it’s vital to have your vet examine your cat so he can give you a diagnosis and prescribe the right treatment. For a cat, “letting nature take its course” won’t work. The cause of your cat’s cough can range from infections to a heart condition, foreign bodies in his lungs, aspiration pneumonia, asthma, allergies, feline respiratory disease complex, protozoal infection and bronchitis. You won’t know what’s causing your cat’s cough or any related symptoms, which makes it important to consult with your vet. Write down any other symptoms your cat is showing, such as coughing up blood, violent cough, retching and vomiting, or sudden collapse. You might hear a sudden coughing, as though your cat is about to hack up a nasty hairball -- Ewww! His cough will be harsh and dry and he might wheeze. If you look closely, you might see him bringing up a frothy mucus. Check out his posture. He’ll squat and his shoulders will be hunched forward. Check to see whether his neck is close to the ground and extended out from his body. If he’s breathing with an open mouth, is lethargic, and has a hard time breathing after exertion, you should mention this to your vet. Look, too, for an upward extension of his neck should he start gasping for breath. If you see any of these symptoms, get to the vet immediately. Your feline can quickly go from minor symptoms to a cardiopulmonary collapse. Infections can range from viral and bacterial to fungal. Bordetella, mycoplasma, salmonella and Pasteurella are among bacterial infections that require treatment with antibiotics. Fungal infections can include Blastomyces, Coccidioides, Cryptococcus and Histoplasma. Your cat will need an anti-fungal medication to recover. Viral illnesses include feline respiratory disease complex and some interstitial pneumonia. 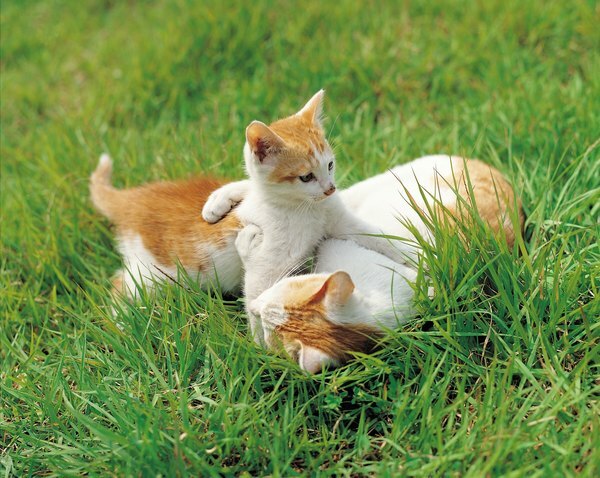 If your cat is diagnosed with parasites such as lungworms or heartworms, these definitely need to be treated. Another possible cause of intermittent and painful coughing is an abnormal growth or tumor called a neoplasm. This must be diagnosed by your vet. Once your vet makes a diagnosis, he’ll prescribe the most appropriate treatments for your cat. Cats can aspirate, or breathe, food particles or their vomit into their lungs. This is pretty nasty, so it needs to be treated. If it isn’t, your cat could develop aspiration pneumonia, making him one pretty sick and uncomfortable little fellow. Cats have an amazing ability to aspirate foreign items into their lungs. Your vet can examine and X-ray your kitty to determine whether this is causing his symptoms. Cats can develop cardiomyopathy, which is an inflammation of the heart muscle. This weakens his heart and can cause coughing, just as the condition can in humans. If your vet diagnoses cardiomyopathy, talk to him about possible treatments. With appropriate treatment, your cat can live several years after a diagnosis of cardiomyopathy. Your cat might have allergies. It’s that simple. Your vet can run several tests to identify what your cat is allergic to. One of several medications can provide relief . You’ll have to change your home’s environment to get rid of the allergens. HEPA filters can help to eliminate dust and pollens. If your cat is allergic to cigarette smoke, the smoker will have to find a way of not exposing your cat, or he’ll have to quit smoking. If your cat is allergic to aerosol sprays or perfume, you’ll need to stop using these. If your cat’s cough sounds deep and the coughing comes in spasms or paroxysms, he might have chronic bronchitis. Here again, look at his posture as he coughs. His neck will be extended and he’ll cough up phlegm. If he has coughing spasms after exercise, he might have acute bronchitis. Your vet is the only professional who can diagnose these conditions, so take him in. If the vet determines that your cat has bronchitis, he can prescribe the best treatment. Do Loud Noises Affect Cats?